Add cold water to a large bowl along with a 1/2 cup of Kosher salt. Mix and dissolve salt. Allow mussels to sit in the salt water for about 20 minutes. Throw away broken shells after you remove beards with a small knife. Sauté garlic in oil in a large stock pot over medium-high heat. Cook until fragrant, about 2 mintues. Be careful not to burn your garlic. Add the onions to the garlic and cook until translucent, about 5-6 minutes. Gently stir in the tomatoes and cook for about 20 seconds. Change the heat to medium and simmer for 10-12 minutes. The sauce will thicken a bit. Mix in the horseradish and some salt and pepper. Adjust seasonings by tasting the sauce. 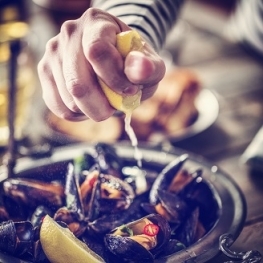 Drain water from mussels and rinse them before you add them to the cream sauce. Mix them gently to cover with the sauce. Cover the stock pot and cook for about 5-6 more minutes. Sprinkle with sliced red chilies and serve with lemon wedges.